I did up 4 racks of Back ribs this weekend. I rubbed them down with some of Zillas southwest rub to see how it went with ribs and I got to tell ya Old Zilla has got something there. It gave the ribs a nice bit of flavour and just a bit of heat. 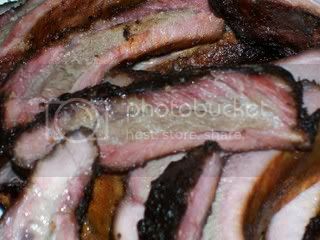 My Ma, who is by biggest critic said they were the best I have dont yet and that is something as she aint a real BBQ fan. I used Royal oak charcoal with Black cherry wood. I used a Honey/mustard/bourbon glaze 3 times during the last hour which gave the bark on the ribs a slight sweetness which complimented the spice of the rub. 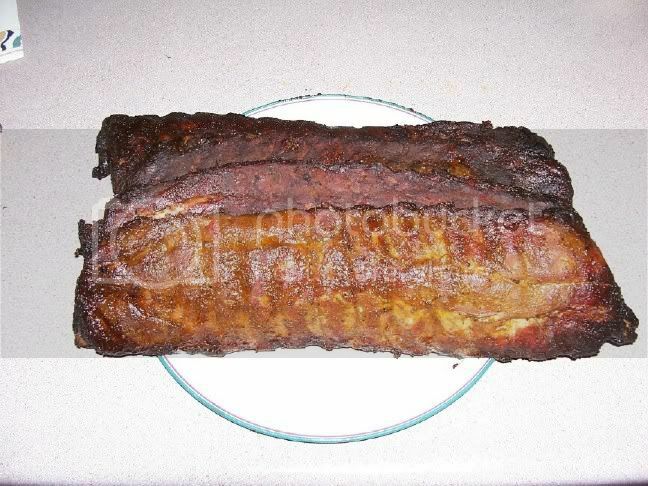 The glaze really darkened the ribs as I dont think honey likes heat too much. Next time I wont go so long with the glaze, the last 20 minutes they got rather dark. I think twice during the last half hour would be enough. On the smokerette, stacked up for lack of room. Sliced up ready for dinner. nice looking vittles Roxy, your mom must love your visits!!! 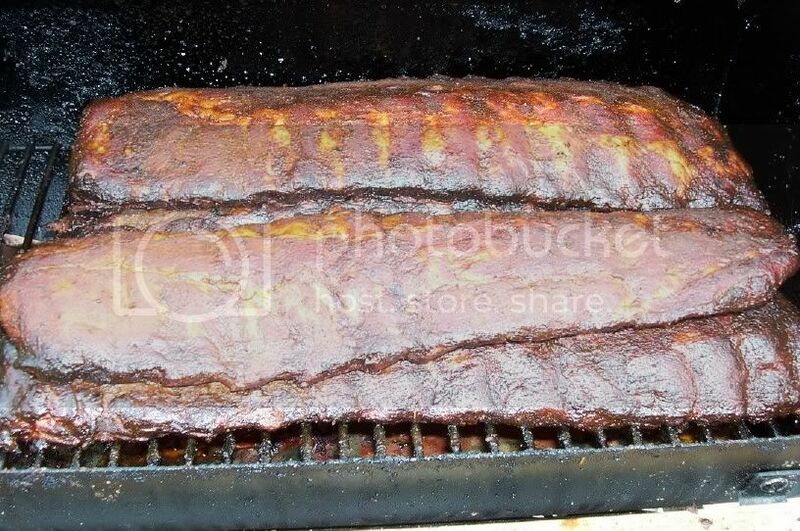 The ribs look great! Just did some sausage here. After seeing your pics, I'm positive now I should have not gone fishing this weekend and should have stayed home for some ribs. They look awesome. Yummy! Those suckers look good roxy. I got to tell ya if ya havent tried the honey mustard glaze you are missing out. It really does bring all the flavour together. 1 tbsp of the rub you used to season the ribs. Mix together ingredients and heat in a microwave till hot. With a basting brush, apply generously to both sides of the ribs several times in the last half hour of cooking. I'm glad it worked out for ya! I copied the glaze recipe, is it yours? I'm doing racks of spares for my son and his new bride tomorrow I'm going to use it, Thanks bro. Thanks for posting the recipe Roxy, it looks real good! Gonna have to give that a try real soon. Hey Alien, just noticed the new avatar! That's a good one! Yea, I got bored, and had a few minutes to monkey with it. Tried to put sound with it, but it got too big. Well, I cant claim it for my own as it is one I got a while back from Jeff as I recall. But I did modify it some with the addition of bourbon and rub. Thanks Alien, that means a lot to me coming from the king of the smoke ring. Tony my friend, ya wouldnt want to see the beef short ribs I did.. If I had a dog he would be well fed..
Due to lack of space in the smoker they were over the hot spot and ended up looking like burnt offerings. i did ribs also but do to my tower being fryed i've been using my laptop so sorry no pic's. Your pork will turn out with that deep, shiny, burnt cherry look, and the mustard is enough for flavoring, without turning the meat yellow. All ingredients need to be mixed at room temperature to prevent separation. Heat until it gets to a simmer and stir a few times during the process. Allow to rest until cool, for this makes it thicken and stick to the meat better. Enjoy. 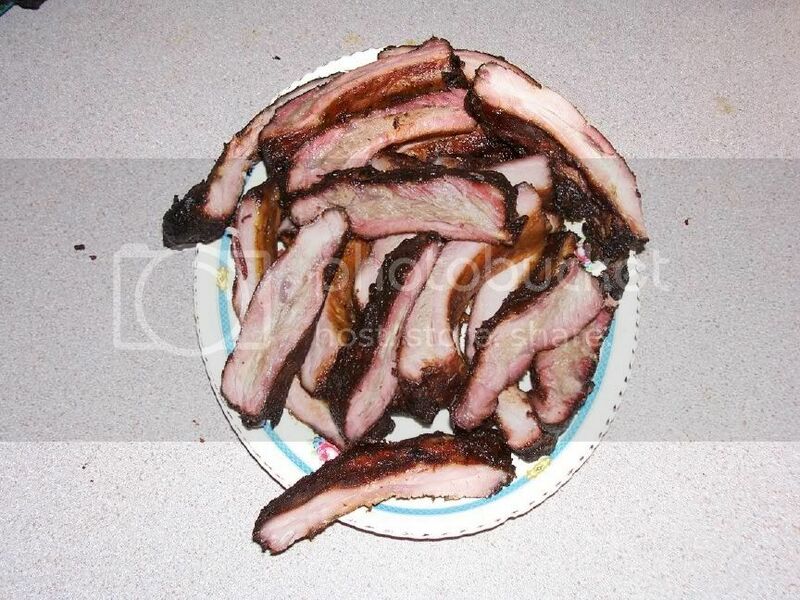 Apply to ribs IMMEDIATELY after taking them off the pit. One heavy glaze will do. Use a pastry brush. If using glaze on butts, loins, or tenderloins, apply a couple of times about 20 minutes or so before removing meat from pit, then once again after meat is off. This is if you are cooking indirect, not over direct heat. Hmmm Bout the only thing there that is the same is mustard and some vinegar..
O.K... That glaze is now called "Roxy's Honey mustard rib glaze". Thanks Mike, Havent really done BB's that much as they are usually over double the price of spares but these ones turned out real good. Hows things down in sunny Florida, we had a blizzard here today..